Not very well, as it turns out. I’ve been on a regular jam-making roll here, having made strawberry, raspberry, blackberry, strawberry-rhubarb, peach and cherry in the past week or so. 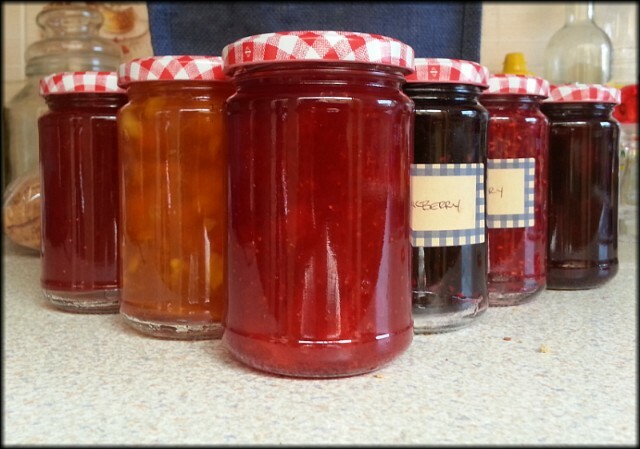 Despite my cries of woe, the strawberry did in fact set up, so I have a wide array of lovely jams. The cherry, though. Last year’s attempt at cherry jam was Too Soft, IMHO, and this year in a misguided attempt to make it set up better I essentially doubled the pectin. The fruits of my labor, so to speak: strawberry-rhubarb, peach, strawberry, blackberry, raspberry, cherry. Did you ever figure out the lesser amounts of sugar that can be used and still allow it to set, instead of following the outrageous six-cups-for-peach-jam instructions on modern Certo packets? My peach jam recipe had SEVEN cups of sugar. o.O I've been running it at about 5.5 and it works nicely. In general I'm using more than 1:1 by about 1.5 cups, I'd say, and so far it seems to be working. It's the taste that counts! Umm, cherry jam, one of the few things that could make me wish that I could eat sugar again "cherry lurve"
Wouldn't the pectin set up without sugar OK? The pectin provides the body, yes, no? Cherry pies can be tough. Our one attempt unsuccessful. We make apple pies 5" deep in a 14" skillet, and only use 1/4 cup brown sugar, many apples and a good amount of lemon juice for the sweetness balance, and you can really taste the APPLES! Fresh apples are the secret there. Schrew that sugar business. And oatmeal to soak up the juice- steel cut the best.